Are there wet spots in your lawn, yard or driveway? Need new drain tile? Gutters are not draining anywhere and you’re worried about water damage, due to flooding, to your foundation? Is the driveway sloped to your home or foundation? New piping or drain gutters can be laid anywhere to better channel your rainfall either to a different spot on your property or to the storm drain to prevent pooling. Would you instinctively call a plumber if your yard, garage or basement was flooding? Yes they will fix the problem but they may also make a huge mess of your landscaping and it’s not their expertise to fix it. We will do it all and at a more affordable price. We can guarantee that we will fix your drainage issue and also match or beat any plumber quotes. We will not be charging plumber rates therefore will be able to make the renovation more affordable for you. 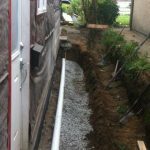 We specialize in drainage, due to the extensive drainage courses taken by our owner Ryan Nicholson in Germany and the 20 + years of hands on experience fixing residential drainage issues in the Tri-Cities area. 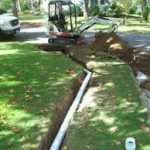 We practice proper drainage techniques in compliance with municipal bodies and can fix all your landscaping at the same time. 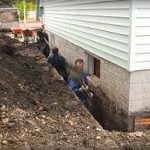 Unfortunately many homeowners don’t realize drainage problems until the problem hits their home’s foundation. Let us come to your property and give you a proper drainage assessment for free. To help prevent costly damage caused by improper grading or gutter run off. Why install paving stone or paving slabs instead of concrete?